Sometimes when you depart a country you have a feeling that you will return; Afghanistan was not one of them when I left my first visit a year and a half ago. It is a nation deeply troubled, immersed in war, torn apart by forces from without as well within, deeply divided by religious and tribal ideologies, and racked by poverty. It was for these reasons that I had doubts of ever setting foot on its soil again, and it is precisely for these reasons that we are returning. The International Herald Tribune reported an interesting trend at the Mobile Congress in Barcelona earlier this month: "green" cell phones made of recycled and biodegradable materials that require less energy than regular cell phones. Until now, there have been few environmentally-friendly cell phone options available to consumers. This seems, however, to be quickly changing! Nokia, the Finland-based manufacturer that made one of every 3 cell phones sold last year, introduced "green" features on a number of its mobile products, including sensors that detect natural light to allow the phone to save energy, and chargers that beep when they are fully charged, cuing the owner to unplug them from the wall socket. Afghan Teddy Bears Have Arrived! For those of you who have been following our blog, our first teddy bear shipment has finally arrived from Afghanistan. These bears are a part of Teddies For Two, the share-a-bear program that allows customers to buy two handmade teddy bears for just $28 - one bear is shipped to you, the customer, while the second bear is donated to a child living in a refugee camp or orphanage in Afghanistan. In many cases, your donated bear may be the first toy this child ever receives! 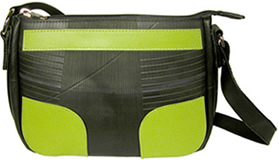 (Wholesale customers, please contact us for pricing). A new Greenpeace report published this week reminds us that each cloud has a silver lining: Taxpayers' wallets will be hurting after the economic stimulus, but the proposed plan will cut carbon dioxide emissions by 13 million tonnes per year. That's the greenhouse-gas equivalent of turning off the electricity in 7.9 million U.S. homes or taking 13 million cars off the roads! "The fact that the federal government could spend so much money to slow global warming means we've really turned the page as a country," said Kert Davies of Greenpeace. 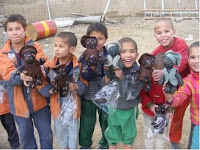 Last year, One World Projects began participating in a teddy bear distribution project in Afghanistan. 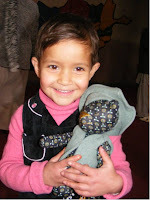 For each teddy bear that we sell, another is donated to a child living in an orphanage or refugee camp in Afghanistan. Below is an update about our latest donation of bears, which were delivered this holiday season to four different Afghan orphanages by Wazhma Sadat, one of our Afghan artisan partners. What she found touched our heart, as we know it will touch yours. When Wazhma gave teddy bears to some of the children, it was the first toy they had ever received! This is Shazia (photo on left) just after receiving her bear. Shazia's father was killed in a bomb blast two months before she was born and her mother remarried, abandoning Shazia and her two siblings as she couldn't afford to raise her first husband's children. Shazia now lives with an uncle (her father's brother) and spends most of her time at the orphanage. Her smile at receiving her first toy makes all our efforts in Afghanistan worthwhile.